Description: This is a smaller version of our very popular Paderborn Hares mold. A trio of rabbits chase each other in an endless circle. The bunnies are set against a ring of tulip, daisy, and edelweiss shaped flowers. 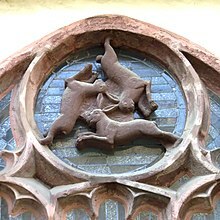 Shown above is the Dreihasenfenster (Window of Three Hares) in Paderborn Cathedral. The three hares (rabbits) symbol features three bunnies chasing each other in a circle. The design has a threefold rotational symmetry. Each of the ears is shared by two hares, so that only three ears are shown. When used in Christian churches, it is presumed to be a symbol of the Trinity. Looking for a larger version of this mold? Check out our Three Rabbits / Hares Paderborn Springerle Cookie Mold.